We’ve yet to see even a hint of gameplay for the newly announced Elder Scrolls Online, but a good portion of the fan reaction to the news has been negative, according to a report at GamesIndustry.biz. The site says that many of the comments on Bethesda’s blog were filled with despair at the prospect of an online title gobbling up development resources or otherwise impacting one of gaming’s most beloved single-player franchises. A Bethesda moderator even chimed in to calm down the angst-ridden faithful. “The teams working on these games are separate. Todd Howard’s team at BGS will keep doing the type of games they like making, and the ZeniMax Online team will focus on MMO games like this newly announced title,” the spokesman said. ZeniMax is scheduled to release the game’s first trailer at some point this morning. I initially was against this, and now I’m cautiously curious (I guess that’s the proper way to describe my feelings). I’ll continue to be an Elder Scrolls fan so long as new Elder Scrolls games continue to be fun and immersive, and moddable. I’ll view the mmo version as a completely different and unrelated animal that just happens to share some characteristics, and I suggest others do the same. I simply suggest that others do what I am doing, and wait and see a completed game (or at least a beta) before you judge. And judge it as you would any other MMO and not as an Elder Scrolls MMO. That’s really the only fair way to judge a game, anyway — on its own merits, and not on the merits of the series that spawned it. The whole ‘themepark vs. sandbox’ question annoys the hell out of me, as if being one or the other guarantees a quality, well-made, fun to play game. I personally reject that question as being one of significant relevance in this case. My only feeling on the matter is that well-made and fun sandboxes are a lot rarer than theme parks. But that doesn’t mean that we won’t be pleasantly surprised in this case. (But it also doesn’t mean that we will be). If the game looks like anything I’ve seen in the screen shots, I will not be buying it. Not because it’s an MMO, not because it uses the Hero Engine, but because it’s nothing new. I’m not saying it’s copying WoW but it’s abandoning some of the key elements that make The Elder Scrolls memorable. To take a game that is so successful without hot bars, with fantastic first person capabilities, and unmatched graphics, and to completely change it, is suicide. 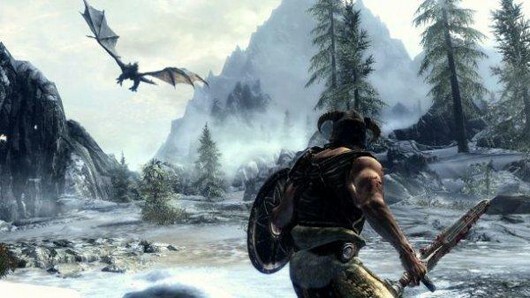 To make Skyrim an Online game would be one of the best MMO’s out there. But they’ve decided to go in a different direction for some reason; I hope they see their mistake.